A Prophet (French: Un prophète) is a 2009 French prison drama-crime film directed by Jacques Audiard from a screenplay he co-wrote with Thomas Bidegain, Abdel Raouf Dafri and Nicolas Peufaillit. The film stars Tahar Rahim in the title role as an imprisoned petty criminal of Algerian origins who rises in the inmate hierarchy, becoming an assassin and drug trafficker as he initiates himself into the Corsican and then Muslim subcultures. For Audiard, the film aims at "creating icons, images for people who don't have images in movies, like the Arabs in France," though he also had stated that the film "has nothing to do with his vision of society," and is a work of fiction. The film won the BAFTA for Best Film Not in the English Language and nine Césars (including Best Film, Director, Actor and Supporting Actor), in addition to prizes at both the 2009 Cannes Film Festival and the London Film Festival. It was nominated for the Best Foreign Language Film at the 82nd Academy Awards. Malik El Djebena, a 19-year-old French youth of Algerian descent, is a small-time petty criminal who's just moved up to the big time. In his first adult conviction, he's sentenced to six years in prison for assault of police officers while resisting their petty drug arrest of him. Alone and illiterate upon his arrival (at a major prison), he's thrown into a no-win situation, not of his making. The prison is the permanent confinement of a major leader in the Corsican mobsters, Cesar Luciani; who, while incarcerated as well, is still fully involved in the leadership of the Corsicans' organization, in and out of prison. Malik, unfortunately arrives in the same prison transfer group; with a North African Arab criminal; who is known to the Corsicans as being a snitch; and who's seeking to obtain a lighter sentence by informing on what he's learned and done with the Corsican Mob. Like Malik; he's put in segregation upon arrival and will be made Malik's cellmate after their initial screening and classification. The prison's plan for his protection is to house him with his fellow Arabs; after classification and health quarantine, so as to prevent any conflict arising with the Corsicans. The Corsicans and their leader Luciani of course know all of this; and have been awaiting the arrival of this informant. Their instructions are that this Arab is not to live long enough to either be protected by his fellow Arabs in prison; or to be used as a prosecution witness against the Corsican Mob. Luciani has had his men watching every arrival bus and van. Luciani has decided that the best way to do the informant's hit, is while he's still in isolation; and before, he's moved into the general population; where, his fellow North Africans can protect him. So to do the actual hit, Luciani needs an unaffiliated (with the Arab prison mob), Arab, who is also in initial isolation as well; and who can gain the confidence of the man he's going to murder. Having thus decided upon Malik, and while he's still in isolation, the guards (who the Corsicans also control) allow Luciani, and a few of his henchmen to come and visit Malik in his cell while still in isolation. Luciani tells Malik what it is he is to do; and that if he refuses, or tries to seek help from the prison authorities; he will be punished, or he will be killed. Malik in terror and fear of killing anyone, immediately (after Luciani leaves his cell) calls to the guards, seeking to be put in solitary confinement, for his protection. The guards of course tell the Corsicans, and Malik is punished severely by beating and made to understand that he's going to do as he's been told, there is no choice. The prison is divided between two main factions: the Corsicans and the Muslims. Malik keeps to himself. When Luciani forces him to be the unwilling assassin of Reyeb, a Muslim witness in a trial, Malik gains the protection of the Corsicans in spite of his Arab origin. Malik serves as a low-level servant to the Corsicans, who treat him with disdain. All the while, he is haunted by visions of the murdered Reyeb. When the bulk of the Corsicans are transferred or released, Luciani is forced to give Malik more responsibility. Having secretly learned Corsican, Malik acts as Luciani's eyes and ears in the prison. When Malik earns the privilege of day-long furloughs outside the prison, Luciani relies on him to conduct his criminal business outside. Ryad, a Muslim friend, teaches Malik to read and write, and the two become close. Ryad teaches Malik about his own heritage, introducing him to two other Muslims, Tarik and Hassan, and increasing his power within the prison. Malik also becomes involved with a prison drug dealer, Jordi. When Ryad gains an early release due to testicular cancer, the three partners organize a drug-running enterprise to sell hashish. But when Ryad is kidnapped by the drug dealer Latif, Malik tracks down Latif's relative inside the prison. He kidnaps the relative's family and forces Latif's gang to release Ryad. When Luciani discovers that Malik is using his day-releases for his own personal enterprise, he punishes him. Malik is sent to meet Brahim Lattrache in Marseille, another Muslim, who is involved in a deal between Luciani and the Lingherris, an Italian mafia group. Lattrache is bitter toward the Corsicans for the murder of Reyeb and holds Malik at gunpoint. When Malik spots a deer warning sign, he remembers a recent dream of deer running in the road. He tells his kidnappers that they are in danger of hitting wild animals, and they suddenly strike a deer. Lattrache is impressed by Malik, calling him a prophet and agreeing to do criminal business with him instead of Luciani, even though Malik admitted that he killed Reyeb. Luciani believes there is a "mole" in his organization and decides to use Malik to assassinate Jacky Marcaggi, the Don of the Corsican mafia, for secretly dealing with the Lingherris. But Malik and Ryad have their own plan for Marcaggi: they kill his bodyguards and dump him in a van with his Corsican enemy Vettori, Luciani's henchman. Malik takes refuge at Ryad's house with his wife and young son. Ryad's cancer has returned; his decision against more chemotherapy leaves him just six months to live. He gets Malik to promise to take care of his family when he's gone. Upon Malik's return to the prison, he is placed in solitary for returning late - putting him out of reach of Luciani's retribution while Marcaggi uses his influence to wipe out much of Luciani's faction. Once back in the general population Malik joins the Muslim faction in the yard. When a now powerless Luciani tries to approach him, two Muslims intercept and beat him. On the day of his release, Malik is met by Ryad's wife and son outside the prison. They walk off together, followed by a vehicle convoy carrying Malik's new associates. Audiard had been thinking about making a film set in prison after he had attended a screening of one of his films in prison and found himself shocked by the conditions. The film's screenplay was submitted to them by a producer and reworked by Audiard and Thomas Bidegain. Audiard cast Niels Arestrup as the Corsican crime boss César Luciani, after featuring him in his previous film, The Beat that My Heart Skipped. He met Tahar Rahim, who plays Malik, when they shared an automobile ride from another film set. To ensure the authenticity of the prison experience, Audiard hired former convicts as advisors and extras. A Prophet received widespread critical acclaim. Review aggregator Rotten Tomatoes reports that 97% of critics have given the film a positive review based on 147 reviews, with an average score of 8.3/10, making the film a "Certified Fresh" on the website's rating system. 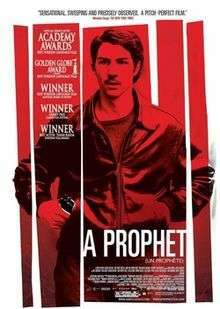 Its critical consensus states that "Featuring an impressive star turn by newcomer Tahar Rahim, A Prophet is a French gangster film filled with arresting, immediate details." At Metacritic, which assigns a weighted mean rating out of 100 to reviews from mainstream critics, the film received an average score of 90, based on 31 reviews, which indicates "Universal acclaim". Director Jacques Audiard (center) and stars Niels Arestrup and Tahar Rahim at the 2009 Cannes Film Festival. Reception of the film after its debut screening at 2009 Cannes Film Festival at the competition was good. A Prophet was picked as the best film of the festival by a group of sixteen English-language critics and bloggers polled by the daily independent film news site indieWIRE. Karin Badt at The Huffington Post called it "refreshingly free". Jonathan Romney of Screen International said that the film "works both as hard-edged, painstaking detailed social realism and as a compelling genre entertainment." Luke Davies of The Monthly criticized some of the film's stylistic methodology and content, asserting that the prophetic themes could have been stretched out, but he celebrated the film's central character and his well-executed "improbable rise from invisibility to dominance", describing "what gives [the film] such dynamic energy is the seamlessness with which this transition unfolds". Davies described the film's main achievement as conveying a character as "someone we care about and gun for," who started life on screen as a blank slate. The film was the submission of France for the 82nd Academy Awards for Best Foreign Film. On February 2, 2010, when Academy Award nominations were announced, A Prophet received a nomination for Best Foreign Language film. The other four films in the category were Ajami, The Milk of Sorrow and The White Ribbon, and the eventual winner, El secreto de sus ojos. A Prophet won the Grand Prix at the 2009 Cannes Film Festival. At the 53rd London Film Festival, it won the Best Film Award. It won the Prix Louis Delluc 2009. At the 63rd British Academy Film Awards, it won a BAFTA for Best Film Not in the English Language. It was nominated for 13 César Awards, tying it with three other films for the most nominations of any film in César history. It won 9 Césars at the ceremony, including Best Film, Best Director, Best Actor and Best Supporting Actor. The film was nominated for the Grand Prix of the Belgian Syndicate of Cinema Critics. The film also won London's Favourite French Film award in 2010, as well as Best Foreign Film at the 13th annual British Independent Film Awards, which were held in London at the Old Billingsgate on December 5, 2010. A Prophet was also nominated for Best International Film at the 8th Irish Film and Television Awards, an award that went to The Social Network. In 2010 Empire magazine ranked it at number 63 in its "The 100 Best Films Of World Cinema" list. ↑ "Un prophète - A Prophet (18)". British Board of Film Classification. 16 October 2009. Retrieved 26 January 2015. 1 2 "A Prophet (Un prophète) (2010) - Box Office Mojo". Retrieved 24 February 2016. ↑ "Entretien avec Jacques Audiard, réalisateur d'Un prophète". Dossier de presse (in French). Cinemotions. Archived from the original on 8 June 2010. Retrieved 2010-03-08. 1 2 3 Badt, Karin (May 18, 2009). "Cannes Favorite: Jacques Audiard's "The Prophet"". The Huffington Post. Retrieved August 21, 2009. 1 2 Turan, Kenneth (May 19, 2009). "Jacques Audiard's 'A Prophet' has a buzz building". Los Angeles Times. Retrieved August 21, 2009. ↑ "A Prophet (Un prophete)". Rotten Tomatoes. Flixster. Retrieved September 17, 2011. ↑ "A Prophet Reviews, Ratings, Credits, and More at Metacritic". Metacritic. CBS Interactive. Retrieved September 11, 2011. ↑ "Audiard's "Prophet" Hailed by Critics, Bloggers as Best of Cannes". indiewire. May 27, 2009. Retrieved August 21, 2009. ↑ Romney, Jonathan (May 25, 2009). "A Prophet (Un Prophète)". screendaily.com. Retrieved August 21, 2009. ↑ Davies, Luke (February 2010). "Lost Boys: Jacques Audiard's A Prophet and John Hillcoat's The Road". The Monthly. ↑ "Academy Award Nominations". CNN.com. March 5, 2010. ↑ "Festival de Cannes: A Prophet". festival-cannes.com. Retrieved May 9, 2009. ↑ "Winner of Best Film Award: A Prophet". bfi.org. Archived from the original on 31 October 2009. Retrieved October 30, 2009. ↑ "French film receives London award". bbc.co.uk. October 29, 2009. Retrieved October 30, 2009. ↑ "Prix Louis Delluc : "Un prophète" sacré meilleur film 2009" (in French). Le Parisien. December 11, 2009. Retrieved December 11, 2009. ↑ "2010 César Winners". César Awards. Archived from the original on 12 April 2010. Retrieved 2010-03-25. ↑ "Winners announced: 13th Moët British Independent Film Awards". The Moët British Independent Film Awards. Retrieved 5 December 2010. ↑ "The 100 Best Films Of World Cinema | 63. A Prophet". Empire.